The Boston Bruins finally entered the series with a tremendous effort in an 8-1 rout of Vancouver. The Bruins seemingly took over the game in the final 40 minutes, but let's not get carried away with ourselves here Canucks fans, it was one game, and it wasn't as lopsided as the score indicates. The Canucks outshot the Bruins 4-1 early on before Aaron Rome leveled Bruins' Nathan Horton with a huge (but late) hit at the Vancouver blue line. Rome was given a 5-minute major, but Boston failed to capitalize. The Canucks took over the rest of the first period, but failed to score. The second period opened with a broken stick that led to a Boston goal, and a second goal off the stick of Ryan Kesler that bounced behind Luongo. Some feel Boston might have had some momentum from the Rome hit on Horton, but a more plausible scenario would be the two lucky breaks they received that instilled on those first two goals that instilled some faith and confidence. 1) Reports on Nathan Horton are positive thus far. Rome's hit was late, but it's hard to blame any player when the hit occurs less than a second after Horton releasing the puck in the middle of the ice at full speed. 2) Odd that 10 years ago, Scott Stevens made a living off of these hits, and the victim was accused of admiring his pass, but you didn't hear anyone comment on Horton admiring his pass - the blame was all on Rome. 3) An 8-1 loss may be better for Vancouver than a 2-1 OT loss. The Canucks don't always bounce back right away from embarrassing results though, but it's almost easier to shake off this one and come back stronger next game. 4) Anyone who wants to criticize Robert Luongo for tonight's game should give their head a shake. Two fluke goals, a shorthanded breakaway, a lot of second chances and open space for the Bruins. Don't think there's one goal to be blamed on. 5) Alex Edler's stick. Why wouldn't players be checking their sticks before the beginning of a period? You can bet the Canucks will be testing them before periods from now on. That's a preventable play. 6) Vigneault asked Luongo with 8 minutes left if he wanted to leave the game. Kudos to Luongo for staying put and not pulling a Miikka Kiprusoff and abandoning the team. 7) After calling out Maxim Lapierre for making a mockery of the NHL with his 'bite my finger' taunt at Patrice Bergeron, it was certainly entertaining to see the Bruins' Mark Recchi and Milan Lucic do the same to the Canucks. 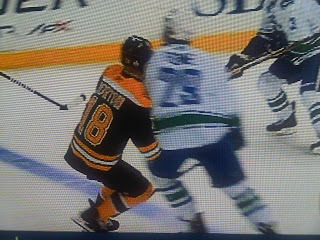 8) CBC's HNIC focused on Zdeno Chara slashing the back of Sedin and Burrows' ankles, and Milan Lucic had a few whacks at Alex Edler. On the 'heels' of Rich Peverley slashing Kevin Bieksa in Game Two, it appears the Bruins aren't above taking cheap shots either. 9) Game 4 should be another battle and it will be interesting to see who will prevail. Canucks' fans should be encouraged that they didn't back down one bit from the physical play in Game Three. Horton will be a big loss for the Bruins, who already lack scoring (although not tonight apparently). 10) The Bruins had to have this game tonight, and they got it. The Canucks are still in the driver's seat despite the big loss tonight. Expect Aaron Rome to be suspended and Keith Ballard to come into the lineup for Vancouver. Dan Hamhuis still appears to be a little while away, you might even see Tanev / Ballard in for Rome and Alberts. And here's Scott Stevens' hit on Paul Kariya from the Stanley Cup Final from 2003. The lasting story of tonight's game will be Aaron Rome's hit on Nathan Horton, but there was an actual game being played, and the Bruins deserve full marks for winning the special teams battle tonight. Two shorthanded goals, and two powerplay goals, while shutting down the Canucks on 8 powerplays. Granted, 10 minutes into the game the story was the Bruins special teams failure. The Canucks recognized this in their post-game news conference and expect a rejuvenated and determined Canuck team in Game 4 Wednesday night. Speaking of PuckWatch - that's what Horton was doing tonight! BOOM! How can the Canucks play so well one night and completely get hammered on the next game. I love the Canucks, but I don't think they will come back. Or maybe they thew the game so they could win the Cup back home. I hope that this is the case. I think it was a comedy of errors that conspired in one game. They've been 'On' since Game 3 against Nashville really, that's a long stretch, they were due for the let down. But, I think Chicago taught them the importance of momentum. I think the 8-1 score makes it look worse than it was. Bruins were better, but maybe 4-1 better in my opinion! "Rome's hit was late, but it's hard to blame any player when the hit occurs less than a second after Horton releasing the puck in the middle of the ice at full speed. "- you gotta be kidding me, get a stopwatch man. You probably have no idea how long a second takes. That hit was way too late, later than your mentioned second. TSN says they timed the delay at 28 frames, and 30 frames is a second, so it was less than a second. Perhaps you should get the stopwatch?